With special technology that enhances grip, comfort and keeps hands dry, the Ansell AlphaTec 58-335 AquaDri Extra Long Gauntlets are the ideal gauntlet for use in bad conditions. 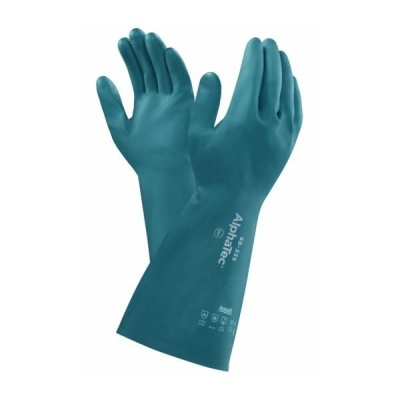 The nitrile coating helps provide both excellent chemical resistance and protection against mechanical hazards, which makes the AlphaTec Gauntlets ideal for safe handling. The AlphaTec 58-335 Gauntlets are available in five sizes that should suit the hands of most users. Please measure the circumference of your hand around the knuckles (excluding the thumb) with your hand open and your fingers together, and the length of your hand from the tip of your middle finger to your wrist.